Wash your hands for at least 20 seconds with soap and warm water beforeand after handling any raw food. Wash cutting boards, dishes, utensils, and counter tops with soap and hot water between the preparation of seafood, and the preparation of cooked or ready-to-eat foods. For added protection, kitchen sanitizers can be used on cutting boards and counter tops after use. Or use a solution of one tablespoon of unscented, liquid chlorine bleach to one gallon of water. If you use plastic or other non-porous cutting boards, run them through the dishwasher after use. Marinate seafood in the refrigerator, not on the counter. Discard marinade once it has mixed with raw juices. If you want to use the marinade as a dip or sauce, bring to a rolling boil before serving or reserve a portion before adding raw seafood. Always cook fish thoroughly. Start by using the 10-minute rule. Measure the fish at the thickest point. Cook 10 minutes per inch, turning the fish over at the half-way point. Add 5 minutes if the fish is cooked in foil or sauce. (The 10-minute rule does not apply to deep-frying or microwaving.) Most seafood should be cooked to an internal temperature of 145ºF. If you don’t have a food thermometer, there are other ways to determine whether seafood is done. For fish, the flesh should be opaque and flake easily with a fork. Shrimp turns pink and the flesh becomes white and firm. Boiling 1 pound of medium shrimp takes from 3 to 5 minutes. Lobster turns red and the flesh becomes white. When boiling, allow 5 to 6 minutes per pound. Scallops turn milky white and firm. They cook in 3 to 4 minutes. Clams, mussels, and oysters are done when their shells open. Throw out any that stay closed. Shucked clams take from 2 to 5 minutes to cook, depending on size. Oysters cook in about 2 to 3 minutes and their edges will start to curl. When using the microwave, rotate the dish several times to ensure even cooking. Follow manufacturer’s recommendations, including standing times. Leftover cooked seafood should be refrigerated as soon as possible and used within 1 or 2 days. If cold or hot seafood has been left out at temperatures between 40°F and 140°F for longer than 2 hours, discard. Uncooked spoiled seafood can have an ammonia odour. This odour becomes stronger after cooking. 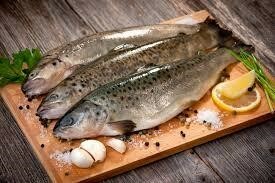 If you smell an ammonia odour in raw or cooked seafood, do not eat it. It’s always best to cook seafood thoroughly to minimize the risk of foodborne illness. However, if you choose to eat raw fish anyway, one rule of thumb is to eat fish that has been previously frozen. Some species of fish can contain parasites, and freezing will kill any parasites that may be present. However, be aware that freezing doesn’t kill all harmful microorganisms. That’s why the safest route is to cook your seafood. An Important Note About Oysters: Some oysters are treated for safety after they are harvested. That information may or may not be on the label. However, these oysters should still not be eaten raw by people at risk for foodborne illness. The post-harvest treatment eliminates some naturally occurring pathogens, but it does not remove all pathogens that can cause illness. Store fresh fish in its original wrapper. Avoid crowding in the refrigerator; allow air to circulate freely around the package. If not cooking within 1 to 2 days, wrap seafood tightly in moisture-proof freezer paper or foil to protect it from air leaks and store in the freezer. Live shellfish should be refrigerated in containers covered with clean, damp cloths—not airtight. Discard shellfish, such as lobsters, crabs, oysters, clams, and mussels, if they die during storage or if their shells crack or break. Live shellfish close up when the shell is tapped. Store canned seafood in a cool, dry place for up to one year. Pasteurized products such as crabmeat can be stored up to 6 months in the refrigerator. Once opened, use within 3 to 5 days.